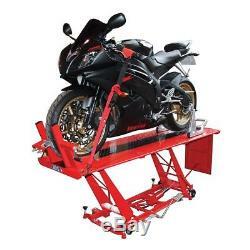 Biketek Hydraulic Workshop Non-Slip Metal Heavy Duty Motorcycle Bike Lift Table. Designed to enable efficient and safe access of motorcycles, allowing repairs and servicing, adding accessories and extensive cleaning. Suitable for both workshops and home garages. The table smoothly and safely lifts the motorcycle to an optimum height and position, maximising workshop and garage space. Suitable for all types of motorcycles and scooters, front wheel locks into clamp, bike held stable by centre stand or paddock stand (not supplied). Table size - 2100 X 620mm. Side and forward locking wheel clamp. Foot operated hydraulic ram lifts 400kgs from height of 200mm up to 800mm. Wheel mounted for ease of manoeuvring, with adjustable locking feet. Removable plate for rear wheel access. Integrated tie-down hook attachment points. This applies to all to our products. Sign Up for our Newsletter. The item "Biketek Hydraulic Workshop Non-Slip Metal Heavy Duty Motorcycle Bike Lift Table" is in sale since Thursday, September 13, 2018. This item is in the category "Vehicle Parts & Accessories\Motorcycle Accessories\Lifts & Stands\Paddock Stands". The seller is "mbsltd-uk" and is located in Bolton. This item can be shipped to United Kingdom, Ireland, Germany, France, Italy, Spain.